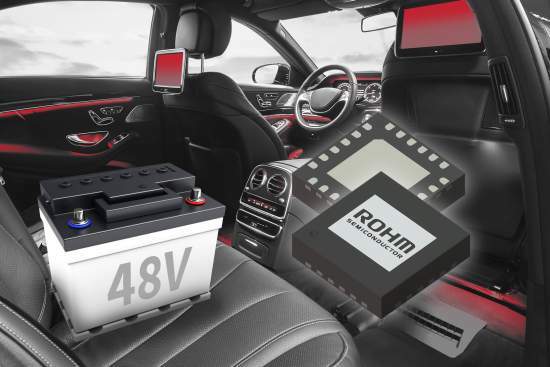 Willich-Münchheide, November 20, 2017 – ROHM Semiconductor has recently announced the BD9V100MUF-C, a DC/DC converter with built-in MOSFET that can generate output voltages of just 3.3 V or 5 V (minimum 2.5 V) from input voltages up to 60 V at a switching frequency of 2 MHz. The IC therefore achieves the highest step-down ratio in the industry – 24:1 – between input and output voltages. To obtain this voltage ratio, the chip uses ROHM’s proprietary Nano Pulse Control technology, which leverages high-voltage BiDCMOS processes and ultra-high-speed pulse control to realise an unprecedented ON time of just 9 ns. The new technology enables single-stage voltage conversion in 48 V systems such as those used in mild hybrid vehicles. At 2 MHz the number of parts required is halved, reducing application size and simplifying system design, while high-frequency operation also permits the use of smaller external components, e.g. coils and output capacitors. Energy savings and environmental performance are the driving force behind constant innovation in the auto industry. Through optimised power distribution, mild hybrid vehicles with 48 V systems achieve significantly lower energy and fuel consumption, which in turn reduces CO2 emissions. Active systems for enhanced comfort in automobiles, such as brake-by-wire or electric power steering, increase the electrical power requirements. In traditional 12 V systems, electrical energy has to be transported to loads at a low voltage level, causing increased losses in the wiring harness. The need for thicker copper wires also adds weight, with a negative impact on fuel consumption. Using 48 V technology cuts the amount of electricity transferred by a quarter, so reducing losses in the wiring. At system level, automobile electronics and sensors typically require a supply voltage of between 1 V and 5 V. This means that the 48 V bus voltage has to be stepped down to the lower voltages. At the same time, it makes sense to operate the DC/DC converter at 2 MHz, as this will not affect the AM radio band (1.84 MHz max.) and allows the most compact solution. To date, no power supply IC has achieved both a high conversion ratio and a high switching frequency. A two-stage solution meets these requirements, but has various disadvantages: it takes up more space, uses more components, and is a more complex system. Now, with the BD9V100MUF-C, ROHM is offering a single-stage voltage conversion solution. Nano Pulse Control refers to ultra-fast pulse control technology achieved by combining analogue circuit design, layout and processes utilising ROHM’s vertically integrated production system. This contributes to greater miniaturisation and system simplification in 48 V applications ranging from mild hybrid vehicles and industrial robots to base station sub power supplies. Technical specifications for the BD9V100MUF-C DC/DC converter, sized at just 4.0 mm x 4.0 mm x 1.0 mm (W x D x H), include an input voltage range from 16 V to 60 V, output voltages from 0.8 V to 5.5 V with ±2 % accuracy, and a switching frequency of 1.9 to 2.3 MHz. The maximum output current is 1 A. The operating temperature range is between -40 °C and +125 °C. Samples of the BD9V100MUF-C are available now, OEM quantities from December 2017.